Chicago Cubs 4, Cleveland Indians 3. The official MLB highlight film of the 2016 World Series between the Chicago Cubs (4) and Cleveland Indians (3). The Cubs battle back from a 3-1 Series deficit to claim their first championship since 1908. Series MVP Zobrist collects 10 hits, including the go-ahead double in the 10th inning of Game 7. Rizzo chips in with nine hits and Schwarber has seven after returning from a torn ACL. 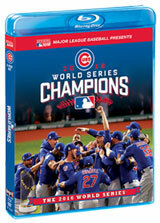 This official World Series film also includes highlights from the entire postseason and bonus features. Select DVD or Blu-Ray + DVD.